Tamagoyaki is a Japanese folded omelet, which is created by rolling several layers of cooked eggs. Fluffy, sweet and sometimes savory, this is a versatile dish that has long been loved by the Japanese. It’s a regular side dish in bento boxes, breakfasts and is also a popular sushi topping. Tamagoyaki tastes different depending on restaurants and households. Some may prefer an overly sweetened flavor, while others prefer dashi added to their eggs. Check out our roundup of the best tamagoyaki destinations in Tokyo. Even if you’re new to tamagoyaki, we’re positive your taste buds will be satisfied. While the fish at Tsukiji Fish Market is what draws people to the market, Tsukiji has more to offer. If you’ve ever visited the world famous fish market, you may have witnessed a number of people eating tamagoyaki. It’s no surprise that Tsukiji is famous for sushi and as eggs are a popular sushi topping there are around 10 shops in Tsukiji that specialize in tamagoyaki. Yamachou serves their eggs piping hot with ground radish on the top. The eggs are available in 2 flavors: sweet and less sweet. Note that even if you opt for the less sweet version their eggs will taste sugary to those of you that don’t have a sweet tooth. The best part about Yamachou? The reasonable price. Costing only ¥100, the tasty tamagoyaki comes with a stick, making it the perfect food for a walk-and-eat. Marutake has been around the block for a while: 80 years to be precise. Consistently serving some of the best eggs at Tsukiji Fish Market, there’s always a queue in front of Marutake. Only using fresh eggs directly delivered from farms, the experienced chefs make an exquisite tamagoyaki that is absolutely mouthwatering. Once you try the eggs at Marutake, you’ll be coming back for more. Fun fact: Marutake is run by famous TV presenter Terry Ito’s family. If you’re a fan of his, this place is a must-stop. Since opening its doors in 1648, Ohgiya has kept things traditional and still cooks in the same process as it did back in the day. Often raved for serving the best tamagoyaki in the city, rumor has it that their “Atsuyaki Tamagoyaki” sells out over 100 in a day. The fluffy texture of the eggs, sweet flavor and splash of dashi make this tamagoyaki an exceptional dish. If you’re an adventurous eater, why not order their kiln-baked eggs? Using 16 eggs, this dish used to be served to feudal lords during the Edo circa. Costing over ¥4,000, the pricing of the eggs are on the pricier side but will taste like nothing you’ve ever tried. The kiln-baked eggs have a refined flavor and taste more like a custard pudding than regular eggs. Beware that you will need to make a reservation for the kiln-based eggs in advance. Ohgiya doesn’t offer any seatings, so take your eggs and head out to Asukasan park. Nestled in the alleys of Muromachi, it’s not hard to walk right past Hannariya. However, this place deserves every egg lovers attention. Even though Hannariya specializes in Kyoto-style small dishes, this is one of the most renowned places for tamagoyaki in Tokyo. Come here for lunch and enjoy their super lunch set. Serving a big-sized tamagoyaki in a broth of rich dashi as their main dish, the lunch set comes along with 3 small sized dishes, a miso soup and a batch of Japanese pickles. The eggs are tender, not too savory and have a well-balanced rich flavor. If you find yourself with some money left over at the end of the month, stop by Hannariya for dinner. While their prices run on the higher end, starting from around ¥10,000, you’ll have more dishes to choose from than their lunch menu. You may not be in Kyoto, but this venue will allow you to indulge in the essence of the former capital. With 80 years of experience under its belt, Daisada knows what it’s doing. Sourcing their eggs from locally-raised red eggs from Chiba, their tamagoyaki have a soft texture. Unlike the other venues I’ve mentioned, Daisada’s eggs are not too sweet and hit just the right spot. Each of their tamagoyaki is delicately handmade and give off a nostalgic flavor. Daisada serves up a variety of eggs, but you can’t possibly miss out on the “Tsukijino” rolls. Often used as sushi toppings at various high-end sushi restaurants, these egg rolls have gained a reputation in the city. 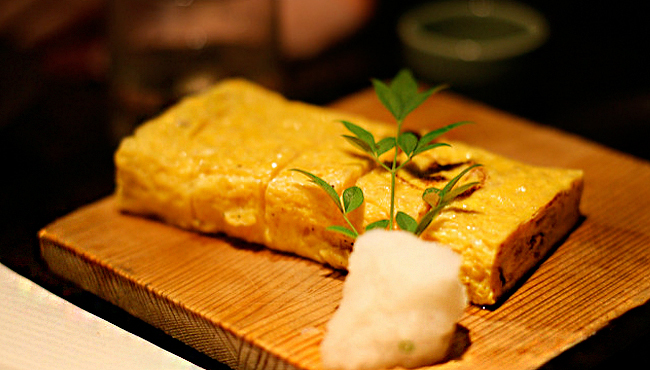 Here are 5 other places that make amazing tamagoyaki. 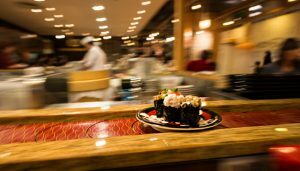 Conveyor Belt Sushi Place You Should Try in Tokyo!! !